MC Moose, originator and pioneer who started his musical career back in the early 1980's on the 'Blue's Parties' of London working with Emotions Sound System playing Reggae, Lovers Rock, and Rare Groove. It was around this time that he moved onto Pirate radio stations such as 'Time Radio WLR' and 'Traffic Jam'. It wasn't long before sound systems moved to Notting Hill Carnival where MC Moose performed alongside the likes of 'Rap Attack' and 'Tim Westwood'. 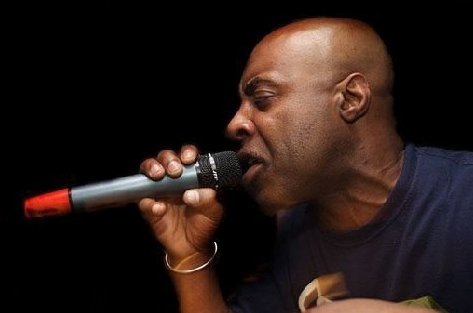 Moose has played at pretty much every major event over the years from Roast, AWOL, Jungle Fever and many more. In 1988 his younger brother took him to his first rave where they were playing Acid House and Techno and this was when he first picked up the mic. 'There was a new MC on the circuit and everyone was about to know about it!' Bookings started rolling in for events such as Stush, Biology, Roast, Jungle Fever, The Pirate Club, Unit 4, Spread Love and many more followed instantly where he's played alongside the likes of Fabio, Groove Rider, LTJ Bukem, Goldie, Mr C, Evil Eddie Richards and Mark Moore from S Express to name but a few. Moose has never looked back and as one of the UK's longest standing MC's he has performed beside many of the greats at all of the biggest and best parties around the globe due to his style of being a slower and more progressive MC, allowing the DJ and music to take prevalence while his voice echoes across the rave..
Today he is still going strong as a regular at Progression Sessions, Fabric, Moondance, Raindance and Metalheadz. Following in his fathers musical footsteps is Moose's son Deejay GPS who was raised on music and found his own passion at a very young age taking to the decks came so easy.